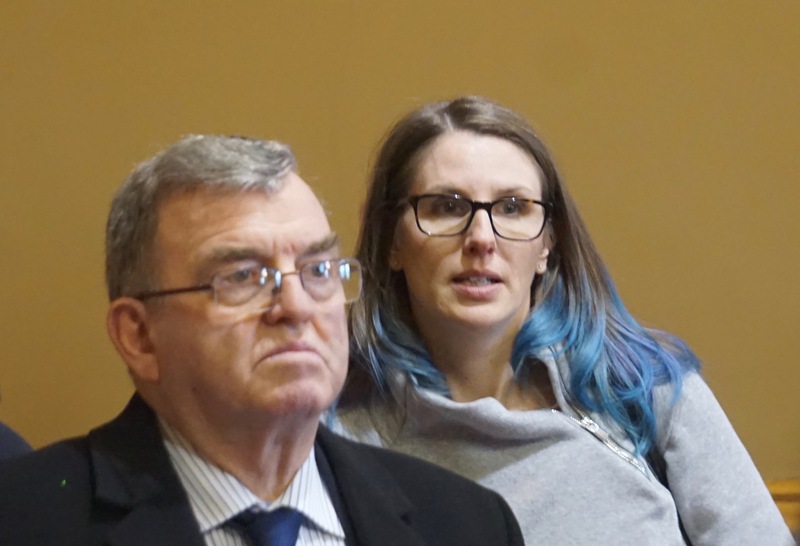 Lindsay Farrell, right, listening to legislative Democrats outline their “values agenda” last week. 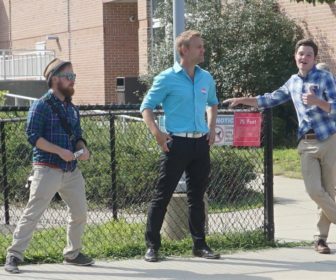 It’s been a rollercoaster for Working Families Party of Connecticut, a union-funded organization that advances progressive issues by door-to-door canvassing, cross-endorsing supportive Democrats and, occasionally, encouraging primaries against Democrats it deems too timid on issues of social, racial and economic justice. In 2011, Gov. Dannel P. Malloy, a candidate cross-endorsed by the WFP, delivered on a campaign promise by helping to pass the first state law in the U.S. that mandates some private employers to offer paid sick days. Three years later, Malloy helped pass the first law committing a state to President Obama’s goal of a $10.10 minimum wage. But the WFP’s influence waned in recent years as Republicans achieved near-parity in the General Assembly and the governor and legislature focused on the state’s chronic budget issues and its failure to achieve economic growth. Other states surpassed Connecticut with laws that enacted paid family leave laws and a $15 minimum wage. Last week, the Working Families got to celebrate the release by House and Senate Democrats of a progressive “values agenda” for the 2018 session and campaign, as well as a State of the State address about “Connecticut fairness,” in which the governor also emphasized WFP issues, promising to help raise the minimum wage and suggesting he was open to a paid family leave law. Our Sunday conversation is with Lindsay Farrell, the executive director of the WFP in Connecticut. It’s been a pretty good two days for the Working Families. But, as you noted after the governor’s speech, it was a return to policies we haven’t heard much about in recent years. So let’s start there. What has the political environment been like for you in the last couple of years. And did it change this week? The speech was fine. It sounded kind of like a greatest hits tour. I think there’s been a big progression, not a play on words, over the past couple years. I think Democrats have been just afraid of their shadows for a very long time, and we’ve seen that in resistance to things like minimum wage increases and paid family leave and fair immigration policies. And we’ve seen that in the way that austerity politics as a whole has been embraced. You know, the Democrats have just kind of taken on this Republican notion that government needs to be drowned in the bathtub. And so we are kind of cutting, cutting, cutting. We can’t raise revenues and there’s been a general level of reasonable skepticism about what role that government can play in improving people’s lives. And there have been some pretty severe political consequences for that. Donald Trump became president I think because the Democratic brand wasn’t associated with enough pocketbook issues, enough of the things that working people and their families need. And down at the more local level here in Connecticut, there’s been a chipping way with fewer and fewer seats in the Democratic caucuses. So that’s what I mean. You attribute that to Democrats being timid on progressive issues? 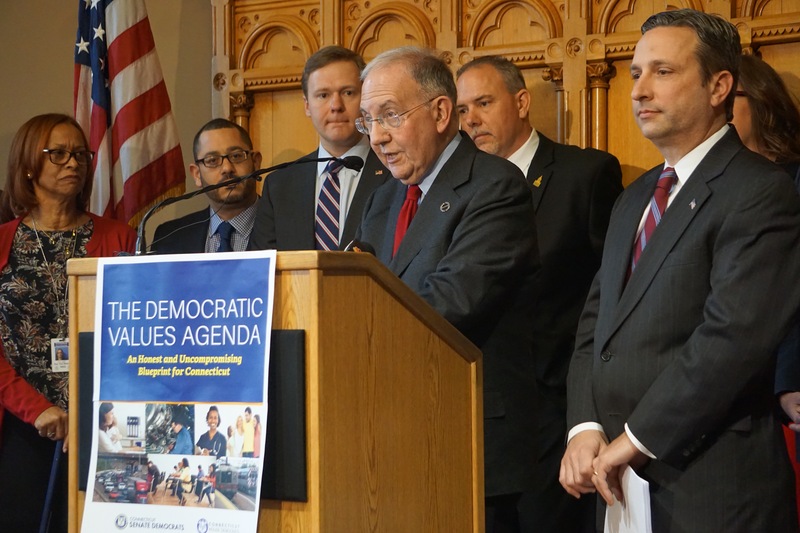 The flip side is others in the state attribute the Democrats’ losses to Connecticut being tired of budget crises and economic stagnation, and that the Republicans as a result have made gains. Right, but we didn’t solve that problem because they didn’t really pick a side on the issues. We didn’t come up with any kind of sustainable revenue solutions. And we also just kept making cuts. Cuts kind of have a self-perpetuating cycle, because you know that’s not good for growth it’s not good for the state. I think, yes, Democrats have lost a lot of seats because of the perception that they can’t handle the budget problems that we’ve had. But part of that perception is that they didn’t actually embrace sustainable solutions. They didn’t embrace realistic and fair solutions. I think they’re very related. They’re kind of the same thing. On Tuesday, the House and Senate Democratic leaders endorsed a progressive agenda, suggesting that with the passage of a two-year budget last year they’re not feeling as beholden to fiscal conservatives in their own caucuses. Does this represent some kind of sea change or does it reflect it’s an election year and this is a way to change the subject from the budget or at least broaden the debate? We have to broaden the debate, because the budget isn’t the only problem in Connecticut. Whether or not that’s just politics, we’ll find out, right? The session will happen, and we’ll try to get votes on these issues, and we’ll see how sincere that was. We want to believe, right? You think the leaders were too deferential to the three Democratic senators who sided with the Republicans and blocked passage of a Democratic budget? Why accommodate these people who won’t let you make progress, whether it’s the budget or other issues, who are going to be obstructionist, who are going to like — can I say it — they’re going to totally screw the caucus. They were accommodated and coddled. And then they stabbed everybody in the back all the same. So I think it would be very reasonable for the leadership not to feel like they have to tie their hands on issues that are really important to people, that poll really well, that are really good politics, just to keep this faction happy, this faction that’s holding everybody back and putting everybody in a really weak spot. Even if the leaders are four-square behind major elements of your agenda, the numbers have not changed. The Senate is evenly split, 18-18. House Democrats saw their majority shrink to 79-72 in the last election, meaning the defection of just four Democrats on any issue gives the GOP a working majority. Right. So that’s I think that’s the other part, even though the leaders are totally committed and follow through on what they’re saying, the math hasn’t changed. I think the tone has. I’ll use paid family leave as an example. Sen. Gayle Slossberg [of the Democrats who defected on the budget] said she wants to work on it. You know this is an important issue, and she recognizes that she wants to do something. Same as [Republican] George Logan. We tried to talk to him about it last year. He’s come to a couple of the screenings. Zero Weeks, a documentary. The title is a reference to the fact that the United States has zero weeks of paid leave, unlike other countries. We’ve been doing screenings. The SEIU poll shows support for leave and a higher minimum wage. The Connecticut Working Families did not come off particularly well in that poll, with only 23 percent of voters having a favorable impression. Eleven percent had an unfavorable impression, and 66 percent had no opinion. The ratio of support to lack of support, I think, is enviable compared to anybody else in that poll. [laughs] I am like super-excited that a third of voters know who we are, right? We’re a third party. So what is your elevator pitch, your explanation to people when they say, what the hell is the Working Families Party? You just expressed a pragmatic approach to electoral politics. We do not want to see the Democrats in the minority. We think that the idea of Republican majorities is terribly frightening. We lose so much, whether it’s clean elections or organizing rights or whatever. We take that very seriously. You know, we don’t want to have a hand in Republicans gaining that much power, because they just don’t know how to govern. Eight years ago, when the Democrats held 114 seats in the House, you could challenge conservative-to-moderate Democrats without fear of costing them the majority. How would you describe the approach in this cycle, when the loss of four seats costs them the majority? We just totally reject the idea that universally Democrats are more electable when they are in the center and they’re kind of presenting themselves offering nothing to the base, but all things to everybody else. Does that vary by district, though? There’s a range. In some districts, the voters there don’t actually share our values on things like minimum wage increases and debt-free higher education and stuff like that. But I think what’s important, and which is borne out by the recent polling and by the election results, is just because voters self-describe themselves as independents or they may not like the labels like liberal, progressive versus conservative, it’s actually not that important to people. What’s important to people is when you talk to them about issues that they care about. When we talk to people and give the elevator pitch about who we are, we just explain these are issues that we care about. We believe that our politicians and our government should be building an economy that’s fair to everybody, not just people who have political connections and a lot of wealth. In districts where people have a lot of political connections and a lot of wealth, that doesn’t play as well. But in those middle-of-the-road swing districts, talking about our issues is a path to success. In 2016, you backed Josh Elliott in a challenge to House Speaker J. Brendan Sharkey, who ultimately retired, for the Democratic nomination in Hamden. Was that a hard call? The speaker at the time made it easier. But where he was bad, he was bad. He was working on this budget [in 2016] to lay off a lot of people and continue with a path of really, really damaging cuts. Joshua Elliott, center, at the polls seeking the seat once held by a House speaker. At left is a Working Families field worker. Was there a broader message to Democrats in that challenge? I think there are a lot of folks who found this a statement about what we’re willing to do, how far we’re willing to go to hold politicians accountable on these issues. I think that was appealing to a lot of people. We were encouraged. We were encouraged to look for somebody to run. So that’s what we did. I can’t tell you who. People in the progressive movement and the labor community. Including in the General Assembly? What do you think? We were not encouraged by the majority leader’s office, if that’s what you mean. We should point out that your husband is chief of staff to the current speaker, who was then the majority leader. There were some rank-and-file members who were very frustrated with the way that budget process was going and what they were being told about legislation that could be brought up for votes. Some of your fights have taken on greater significance because you were breaking new ground, such as the passage of paid sick days in 2011. But wasn’t that a fairly modest bill, with lots of exemptions for certain employers? Basically, anyone who offered vacation time was exempt. The law that we have is incredibly weak compared to every other jurisdiction with paid sick days. We didn’t do paid sick days just to pass it first. We did it because that was an issue that nobody else was working on, that we kept hearing about from folks that we were trying to get organized. It was just an issue that I think really spoke to a lot of our values about fairness in the workplace. With these issues, the WFP sometimes is trying to do two things at once — pass a Connecticut law here and also try to change the larger political environment nationally. Do these issues really belong in Congress? 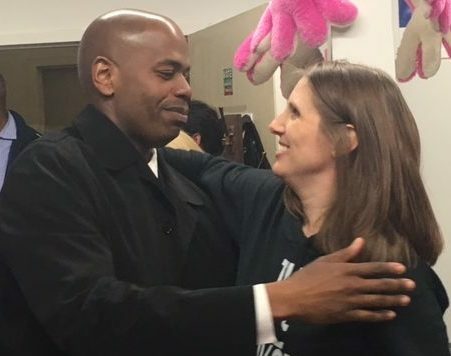 Union official Joshua Hall is congratulated by Lindsay Farrell after he won a special election to the House. The WFP backed him over a Democratic Party-endorsed candidate. We didn’t invent this strategy of taking it to the states first. That’s how minimum wage and all these other things have always come about anyway. With the sick days, it was an issue that we heard about a lot. It was also an issue nobody was working on, so we saw it as a place where we could be value added, where we could bring something to the political conversation that was being neglected. That’s what we tried to do paid family leave, too. And now I think it’s very much a mainstream conversation. Even Marco Rubio has like a terrible idea about paid family leave, but he has an idea of paid family leave. That in and of itself is a victory. Your issues this year include protections for undocumented workers. Years ago when you guys sort of burst onto the scene, that wasn’t on anybody’s radar. Is this a response to the president? I think it’s two things. I think we started with a very FDR-centered view of how to seek justice in the world and over time have evolved to consider that inadequate. We just keep hearing more and more from groups that we work with about issues like that. And so we think that needs to be part of our portfolio. What can the state reasonably do to protect these folks? Obviously if ICE comes knocking, there’s not much for the state to do. It’s like there’s a lot the state can do, and there’s a lot the state cannot do, right? But the state can disrupt it. The state can be uncooperative. The governor has spoken out against Republican immigration policies quite forcefully, but he’s also made the point on sanctuary cities that there is really not a legal meaning to that. His position is the state of Connecticut is not breaking any federal laws, but they’re not going out of their way to help ICE. So, the state is trying to walk a fine line. Do you applaud that? I don’t want to speak for the movement on this. It makes me nervous. So speak for Lindsay Farrell. We do applaud him. You know I know that there is frustration around his resistance to the term sanctuary city and sanctuary state. But I think at the end what is important are the policies. Getting access to financial aid for Dreamers, the undocumented who came here as young children and now are trying to go to college, seems to be relatively safe ground for the state and state legislators. Yes. There’s some frustration with politicians who say, ‘Hey the Dreamers brought here as kids, they’re innocent,’ but still kind of vilify the parents a little bit. That’s not acceptable to us. But [financial aid], it’s also a problem that needs solving. It’s not a fake piece of legislation. The work that those advocates are doing is incredible. It seems there’s always tensions within the political left about compromise, between pragmatism and making a statement, being true to principle. You guys are interesting in how you navigate that. Yeah, we get yelled a lot by the Socialists and the Green Party people. I mean, we believe politics impacts people’s lives in a very real way. So, yeah, we want to push for more. But we need to win things along the way. We make people on both sides angry at us — for not being willing to just do what the Democrats say, or for not being as pure on the left. I mean, I don’t know what else to say about it. It’s just like there is actually a responsibility to get things done. Farrell was pleased that the WFP had a 2-1 favorable/unfavorable rating.